I set out this morning from Arzua at about 7:45 and the day is very overcast and damp. Forecast is for rain this afternoon. But hopefully, I can reach my destination A Rúa before the rain starts. The path is now really quite full with pilgrims as even more seem to have joined this section. I even had to step aside for a group of 20 Italian cyclists cheering as they sped down the hill behind us. I expect, if all goes well, to reach Santiago by late afternoon tomorrow. But of course as my blogging queen Maybelle won’t be getting any information posted over the weekend, you’ll have to wait for news until Monday! I’m taking my time walking today, there’s absolutely no rush. Most of those walking around me seem to be walking with a great sense of purpose. Like they want to get to Santiago quickly or complete their journey fast. Up until this point, we’re now on Day 39, this has been very much about the journey, not the destination. I’ve enjoyed each day for what it brings, in terms of contemplation, meeting people, and interesting discussions. I never really thought about the destination at all, until last night. What will I think and what will I feel when I arrive at Santiago and see the cathedral? For me it was never about the destination, but totally about the journey. A journey that has exceeded all of my expectations. I’m sure it’ll be a very emotional moment however, the first sight of the cathedral. Maybe even collecting my Compostela although it was never really about that. I imagine my thoughts will turn to the future. And how I will apply the lessons that I’ve learned during this journey. To me the journey I’ve just undertaken, is really just the first part. The journey from here on I think, and I hope, will be just as rewarding. Arriving in Santiago, is merely a milestone, admittedly a very important milestone, but a milestone in that ongoing journey. I’ve already had one coffee break this morning and it’s now midday so I’ve been on the road for 4 hours. It really is time for a break, something to eat and something to drink. I saw a cafe up ahead just at the right moment. But as I drew near, there was nothing but bicycles and young noisy men in lycra and piped music coming out of the cafe. Really not the kind of break that I wanted to have during the day! I thought about it for a moment, I really needed a break. But then I pushed on. Four hundred meters up the road was a nice quiet little bar with a cafe serving fresh sandwiches and coffee. Just perfect. I’m just checking the map, it’s another 4 kilometers to my next coffee stop and then just 2.8 kilometers for my stop for the evening. Savour these last 2 days into Santiago Rob, as you say there’s no rush. Take time to sit on the edge of the square and look at the cathedral before finally going in – if necessary wait for what looks like a quieter moment. Then make sure to have a rest day there and soak up the atmosphere of the place. Best Wishes. I’ll be taking Sunday to just chill and visit the cathedral. I’m still enjoying your blog posts. Since I’m currently travelling, I can’t take the time to watch all your videos or even make comments. But I’m following and wishing you Bien Camino! Thanks Clare. Final day tomorrow. Absolutely well done Rob, you have met each challenge and found a way to overcome and carry on. You have embraced the whole experience on both a physical, intellectual planes and touched on the spiritual. You will reach the end of the journey, but I think you will continue your pilgrimage in a different way after. I found when I finished Rob, I had a sense of loss. Losing the daily routine, not to see my Camino family again. This was in some way balanced by all my memories and you have a treasure trove of them. On Saturday afternoon I will raise a glass to your very good health and your pilgrimage. You will be with me in spirit as I reach the cathedral mate. 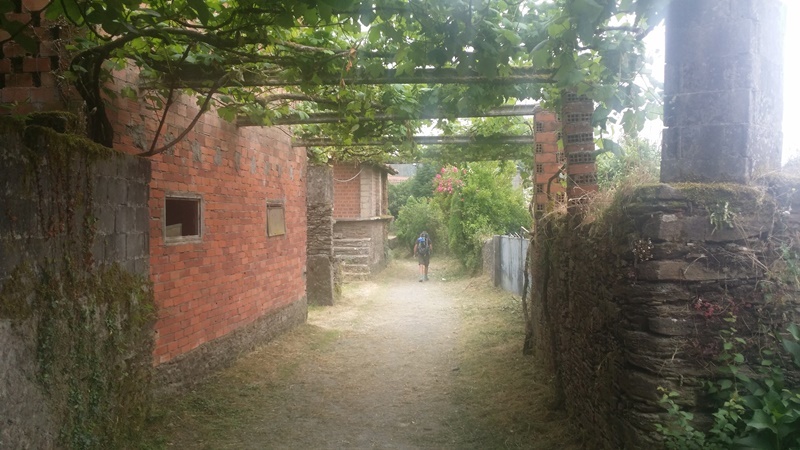 A Camino ‘family’ is very special isn’t it? That was a long hot day! Dear Rob: i am so excited for you. I have followed your journey and read your post. They have been great and have helped me a lot. My husband, my 3 kids (17,16,8) and i will start our Camino next Sunday. We fly into Madrid on Saturday. You inspired me to start a blog and here it is. Hope to hear of your final days I can’t even imagine what that is going to feel,like. Just got my feet up in Santiago. Full reports on Monday. Very well done Rob. I have been following your blog and found it both inspirational and motivational. 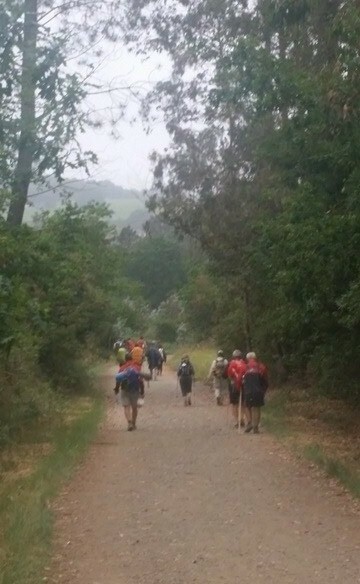 The Camino is very much on my “Bucket List “. It’s certainly an interesting journey Pete!